Kgosi Ntlhe on the attack for Posh against Colchester. Photo: Joe Dent/theposh.com. 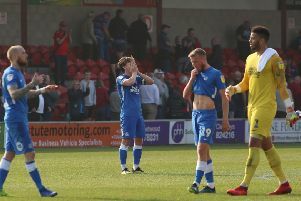 The Peterborough Telegraph’s Alan Swann didn’t disagree with Peterborough United chairman Darragh MacAnthony’s negative verdict on his players following the 2-0 home defeat by Colchester United yesterday (January 10). Match report: Posh 0, Colchester 2 - Manager survives but will his team? Luke James: His poor form is a shame as his attitude is spot-on. Had to deal with some hopeless lobs forward by team-mates and played with little support all game. More effective out wide late on, but his lack of confidence in front of goal was painfully obvious when missing a golden opportunity to fire Posh in front. Colchester opened the scoring two minutes later 5.